This post was sponsored and paid for by SunTrust Mortgage. All opinions are my own. When we purchased our current home (almost three years ago! ), it was the fulfillment of a long standing dream of mine. We knew that we wanted a fixer-upper and that’s what we set out to look for. When the ‘right for us’ house came along, I couldn’t have been more excited to get my hands on a true fixer-upper that we could put our own stamp on! Purchasing a home is one of most exciting things that you’ll ever do, but there much to think about and it can be a bit overwhelming. If you’re just starting the home-buying journey, you’ll find the “Your Guide To Home Buying”, from SunTrust Mortgage, to be very helpful! SunTrust truly wants to help buyers understand the ins and outs of the whole home buying process. This guide will give you the confidence that you need to make it happen. We knew up front that we had a WHOLE house that needed remodeling and updating. Shows on television make renovations look so easy and fast, but the truth is they usually aren’t. The temptation is to just dive in and do everything yourself, but we knew that taking that approach could turn into a disaster for us. Neither one of us wanted to live with a remodel for years and years, plus there were budget and diy ability constraints that had to be taken into consideration. First, we carefully looked at the major projects that needed to be done, such as window replacement, flooring, kitchen remodel and a bathroom remodel. Our next step was to make a list of all of the smaller projects that needed to be done throughout the house. After that, it was simply a matter of breaking everything down into what we wanted to hire-out and what we wanted (and felt qualified) to tackle ourselves. Our kitchen remodel is the perfect example of a project where we felt qualified to do a large part of the work ourselves, but we knew it would take so long to complete, that we really couldn’t even project a completion date. Even though budget was a huge consideration, the time factor convinced us that we needed to bring in professionals. One area we knew we could save money though, was to do the demo ourselves. It only took my husband and son-in-law a couple of hours to remove all of the old counters and cabinets from the kitchen. 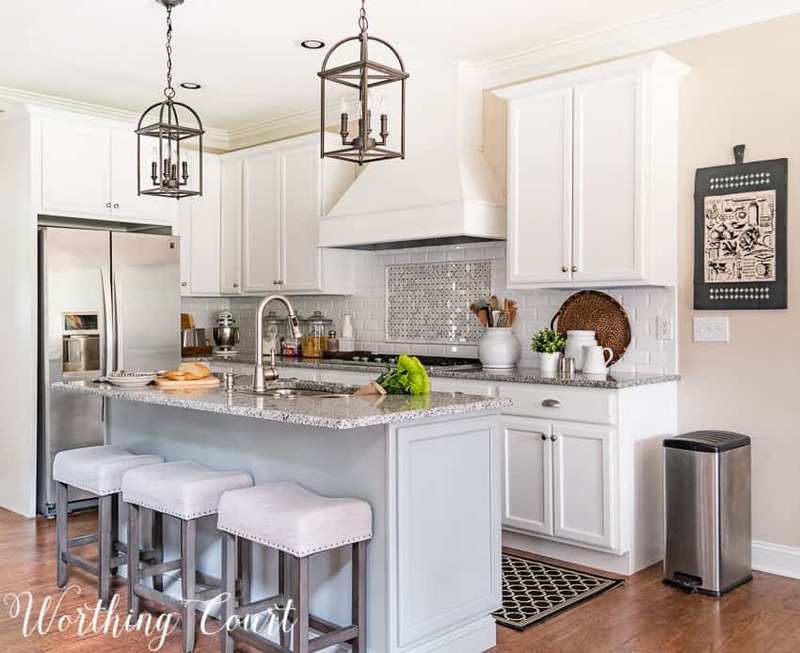 From there, we turned the job over to the experts who installed hardwood flooring, the cabinets, countertops, backsplash and did all of the plumbing and electrical work. 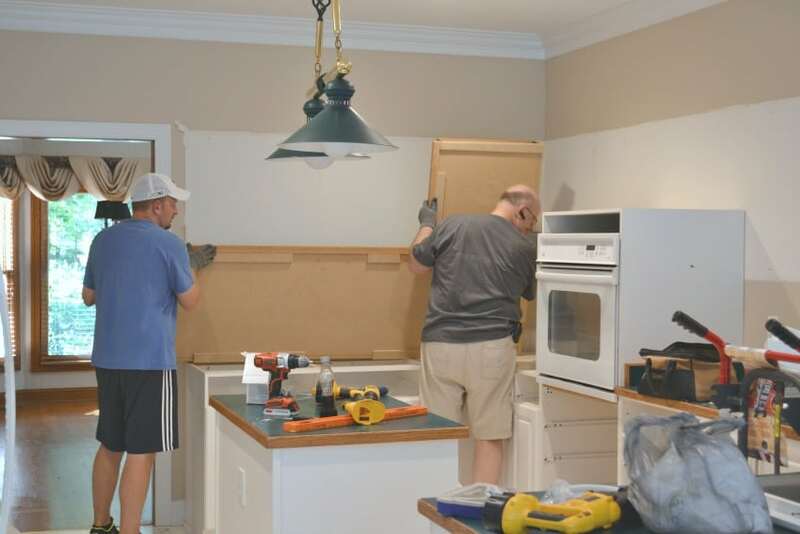 Once the room was completely empty of the old cabinets and appliances, we laid out the new cabinet and appliance arrangement ourselves, by placing masking tape on the floor. For two people who have zero experience with kitchen planning, we are absolutely thrilled with the end result! My favorite part? It has to be the gorgeous statement hood above my cooktop! 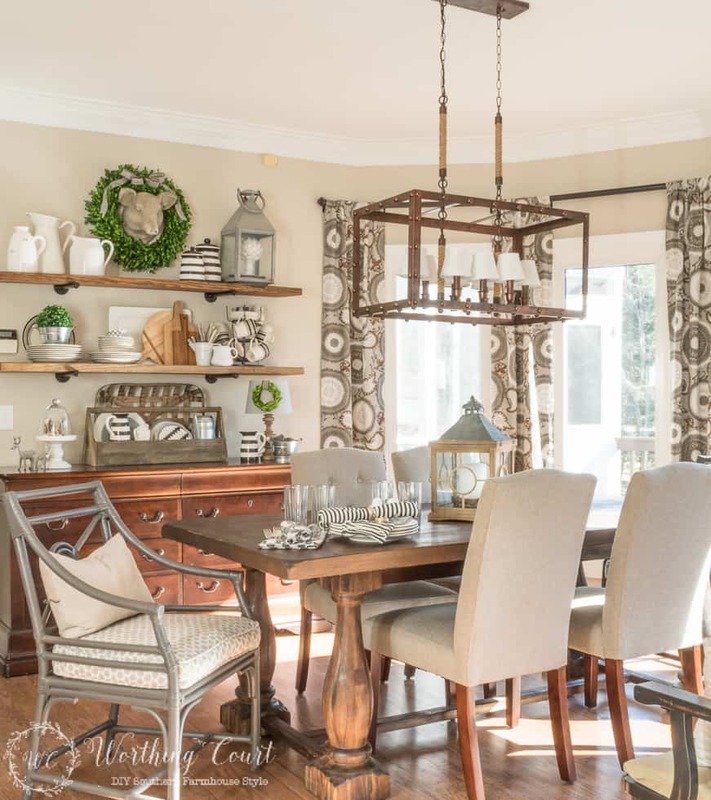 Click HERE to see the full kitchen reveal with before and after photos. There have been many, many projects that we’ve tackled ourselves though! Making the decision to diy as many of the smaller projects as we could, has given us room in the budget to bring in the pros and get some projects completed more quickly than we could have done them. Our laundry room was another gut job. Even though my husband has basic carpentry, plumbing and electrical skills, we made the decision to let the experts take care of the rough-in electrical, rough-in plumbing and replacing the flooring. 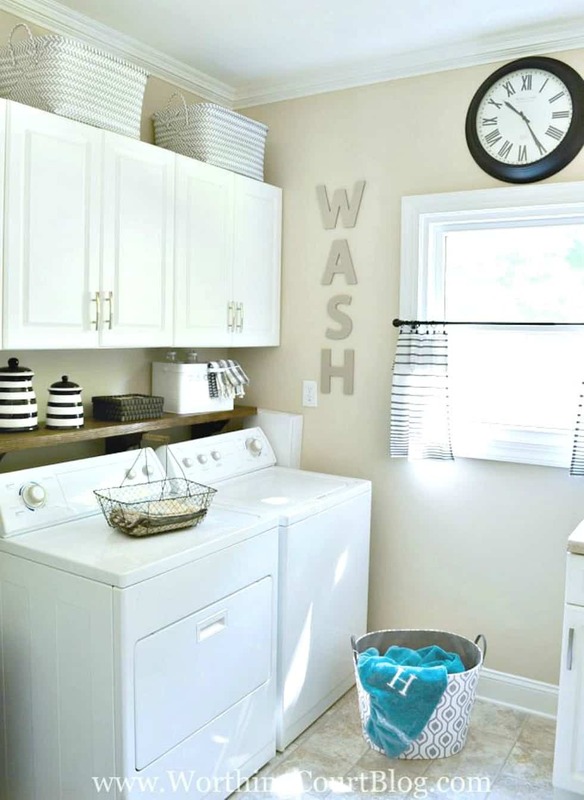 The rest of it – installing cabinets, installing a countertop, sink and faucet and adding the shelf above the washer/dryer was done by us. We saved a huge amount of money by reusing some of the old cabinets that were part of the original kitchen. Check out the full reveal and before and after’s of this room HERE. Once the pros had completed the major projects in the house, the remaining projects were mostly small diy and cosmetic updates. We were ready to truly turn our house into the home of our dreams! It has been difficult, but I have FORCED myself to focus on completing one room at a time. We diy’d several smaller projects in our breakfast nook, such as the open shelves, replacing the old light fixture and adding diy budget draperies and hardware. Click HERE to see the full reveal. The makeover of our dining room required removing the dated wallpaper and light fixture and painting all of the stained trim. A couple of very simple diy projects later and the whole room looks totally different! See the full room reveal HERE. A super fun diy project for the makeover of our home office was turning a cheap set of fake cherry bookcases into something much more updated and functional for us. 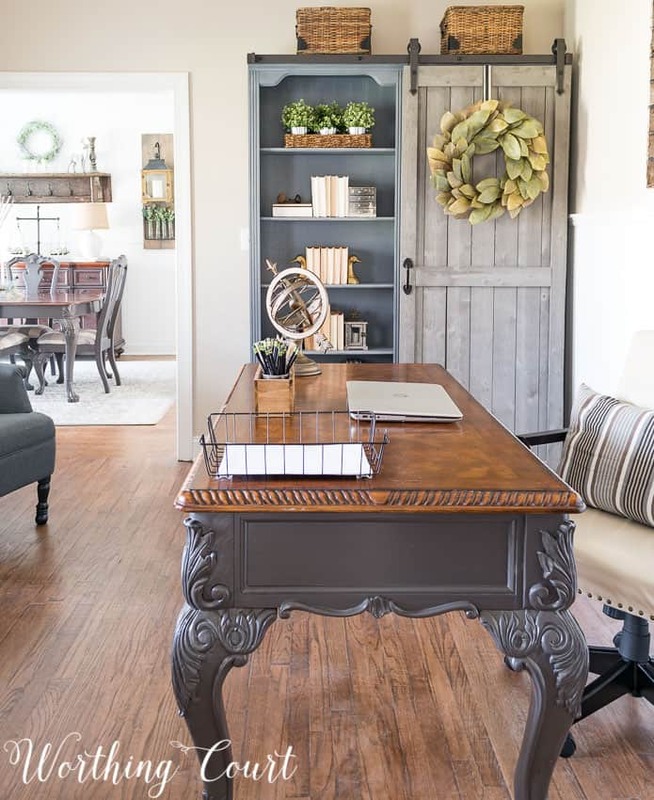 Click HERE to get the tutorial and click HERE to see the full office transformation. These are just a few of the many, many projects that have been completed in our home. 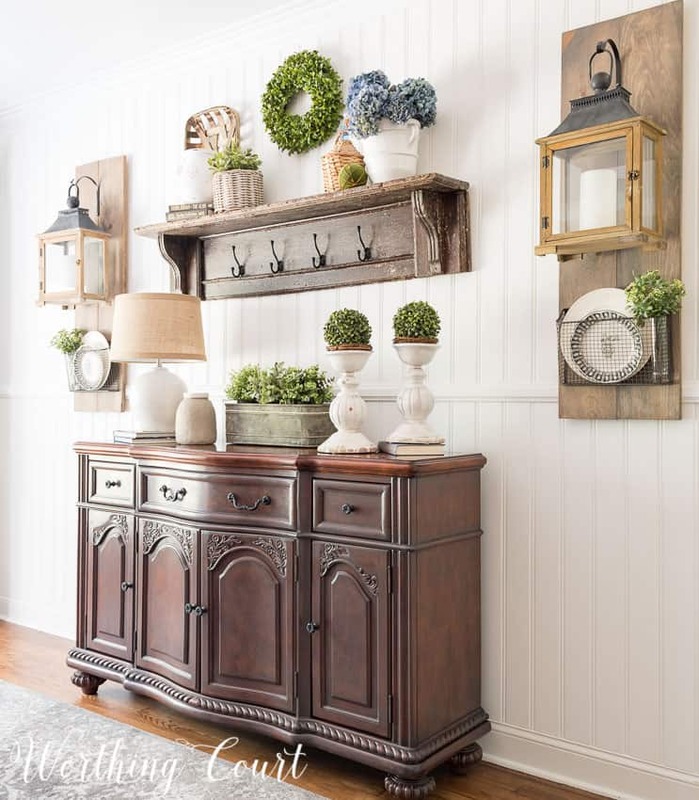 As we continue to make our way through our home, room by room, I’m sure we’ll have more decisions that need to be made – should I diy or call the experts? Your home is beautiful!! You have been an inspiration to me. Thanks for sharing, enjoy your day. Your post was very well written and I’m sure it’ll be quite helpful to others. You continue to be such an inspiration! We purchased a MAJOR fixer upper just over 30 years ago (and of course, we’re still not “done!” — paying just $24,000 for the darling four bedroom Cape Cod that we lovingly call home. We’ve completely remodeled the downstairs — major demo job, replacing every windows, removing plaster, overhauling the bathroom, gutting the kitchen, etc., etc., but it is perfect now to us. Our current project is adding a shed dormer to the back of the house, giving the upstairs bedrooms more breathing space, adding a bath, and building a deck over the porch (this will kill two birds with one stone — not only will it give us another outdoor relaxing space, but it will semi-fulfill my dream of a treehouse as the new deck will put us up into the branches of our beautiful maple tree! Keep the great ideas coming! Having a handy husband is needed for so many of the projects, which I don’t have. Your house is beautiful and you did a terrific job. It is so satisfying to do the projects yourself. I didn’t realize that you set out to buy a fixer upper, or how much you have done to your house. Great job! We built our home in the 80’s, so technically it wasn’t a fixer upper, but after nearly 30 years we have done lots of changes and updating. We still have more to do. We are fortunate that we haven’t had to hire professionals except to replace windows and install granite countertops. Your home is an inspiration to me, and I look forward to reading your blog! Love your kitchen and all the inspiration you provide. I look forward to your blog every day. Great tips! I love everything you did with your home. I love being able to fix up my home and you give me many tips. When my husband and I bought a brand new house, never before lived in, we still ripped out windows and put in doors, added a fireplace. It doesn’t matter to me if the house if old or new – I’m gonna DIY it to death to make it mine. LOL My hubby and I do as much work as we can ourselves – it just seems to mean more and I appreciate the changes so much more than when someone else does it. Thank you for all the inspiration and tips I didn’t consider on my own. Your home is so charming! 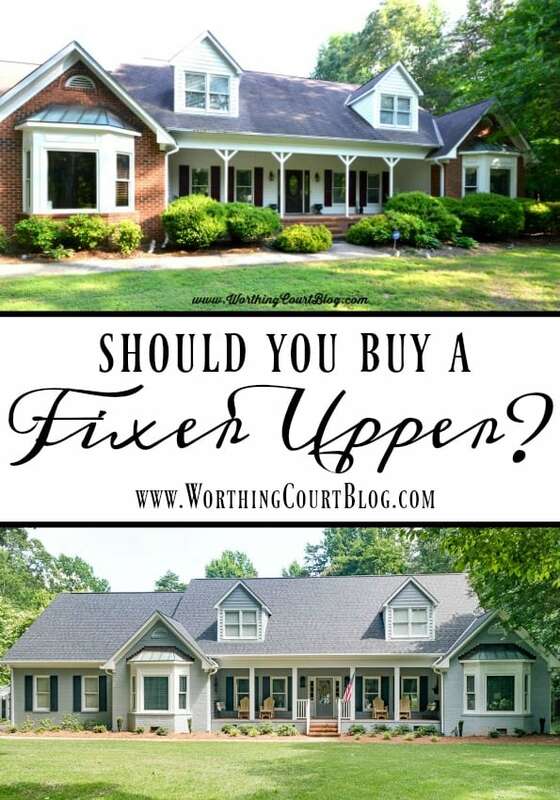 While I’d love move in ready, I think I’m personally drawn to fixer uppers because I love to “save” a home! Love the home! I like the idea or both move in ready and a fixer upper. I love your tips and all you have accomplished in your beautiful home! Much to think about!!! I’m so glad you are sharing your fixer upper with us. My husband and I have tackled several small renovations on our house, but haven’t been brave enough to redo the master bathroom or kitchen yet. Super helpful post, Suzy! Thank you! I just shared with my kids on FB, too! Everything we have, including our house, is or was a fixer-upper! In fact, we have been fixing-up our house a little each year since we bought it 32 years ago. We even took out a wall between the living room and kitchen and raised our low 7 ft. ceiling to a vaulted one a few years back. Big job, but the best thing we could have done for this house. I have wanted to purchase a fixer upper, most that I see are sooo bad! Not just cosmetics. Your “afters” are magnificent, they do give you incentive, but it looks expensive to do a whole house.